↑ "Press Releases 17 July 2003". Toshiba. 17. juuli 2003. ↑ "Microsoft Support 934428 – Hotfix for Windows XP that adds support for SDHC cards that have a capacity of more than 4 GB". Support.microsoft.com. 15. veebruar 2008. Vaadatud 22.08.2010. ↑ "Microsoft Support 939772 – Some Secure Digital (SD) cards may not be recognized in Windows Vista". Support.microsoft.com. 15. mai 2008. Vaadatud 22.08.2010. ↑ "Microsoft Support 949126 – A Secure Digital High Capacity (SDHC) card is not recognized on a Windows Vista Service Pack 1-based computer". Support.microsoft.com. 21. veebruar 2008. Vaadatud 22.08.2010. ↑ "Pretec introduces world's first SDXC card: Digital Photography Review". Dpreview.com. 6. märts 2009. ↑ "Toshiba Sampling First SDXC Flash Memory Cards". DailyTech. 22. detsember 2009. 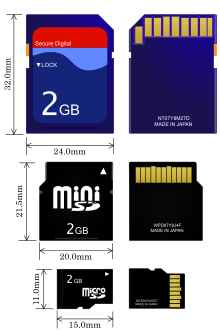 ↑ "I4U News – A DATA Announces SD Card w/ Bi-stable Capacity Display". I4u.com. 14. november 2006.